← What Do Wildlife Conservation and Microsoft Have in Common? At one time or another, we’ve all been guilty of pouring our wine into a paper cup, a water glass, or maybe even that wonderful glassware known as a mason jar. Well, maybe not guilty at the moment, but we cringe now every time we think about such a disaster. So if you’ve just popped the cork, make every effort to find a wine glass, even if it’s the wrong style for the wine in question. From the standpoint of the basics, let’s do a little refresher here, which we’ll confine to three styles. Many consider the “tulip” to be the all-purpose glass. This goblet is narrow in design, and when the wine is swirled, the narrow opening really concentrates the nose—the aroma or bouquet. A version of the tulip has become known as a white wine glass. There is less need to aerate a white, and the design keeps the wine chilled. 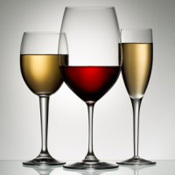 The larger “burgundy” glass is used for reds and provides maximum exposure of the wine to air for “big” (full-bodied) wines—or any red for that matter. The nose and viscosity are easily apparent in this style, presenting a touch of drama to the tasting. Style three is the champagne “flute,” a really narrow shape that prolongs the bubbles, while preserving the chill. It’s clearly the best glass for presenting such a festive wine. Aside from these three basics, there’s another glass of undisputed notoriety, and which has come to be identified with Oregon Pinot Noirs in general: the “Riedel Vinum XL.” The development of this glass was based on the characteristics of the Pinot Noir grape varietal. It’s a lead crystal piece that was specifically designed to enhance the aromas, flavors, and appearance of Oregon-grown Pinot. The glass highlights a bowl that contains a flared top and an ample, round base. By the way, that long stem on the glass serves a very distinct purpose—it prevents the warmth from your hand from altering the wine in any way. Just as the right glass can affect your tasting experience, so can the right temperature. The ideal serving temperature emphasizes the flavors and scents of the wine. “Room” temperature is often a term associated with red wine. In the case of a full-bodied red, such as our Rutting Ridge Cabernet Sauvignon, its ideal serving temperature is warmer than a Pinot. 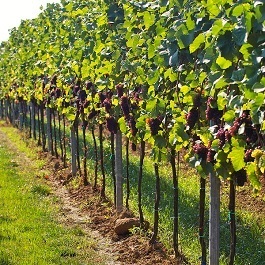 A lighter-bodied wine like Pinot Noir works best if served at between 58 to 63 degrees. If the bottle has been removed from storage or has been sitting at room temperature, the rule of thumb would be for you to put your Pinot in the fridge for 30 minutes. You can even buy an infrared thermometer that will measure temperature through the bottle if you’re into preciseness. One last thing: putting too much chill on a white wine such as Chardonnay or Pinot Gris makes it downright difficult to tell anything about the wine. That chill just masks the wine’s characteristics. Of course in some cases, that’s a good thing. An inferior white can get just plain funky when it warms up.